Psychological Effects Of Mass Shootings Are Widespread : Shots - Health News As the incidents of mass shootings in the U.S. occur, some people are starting to feel numbed by them. Psychologists says this is normal. 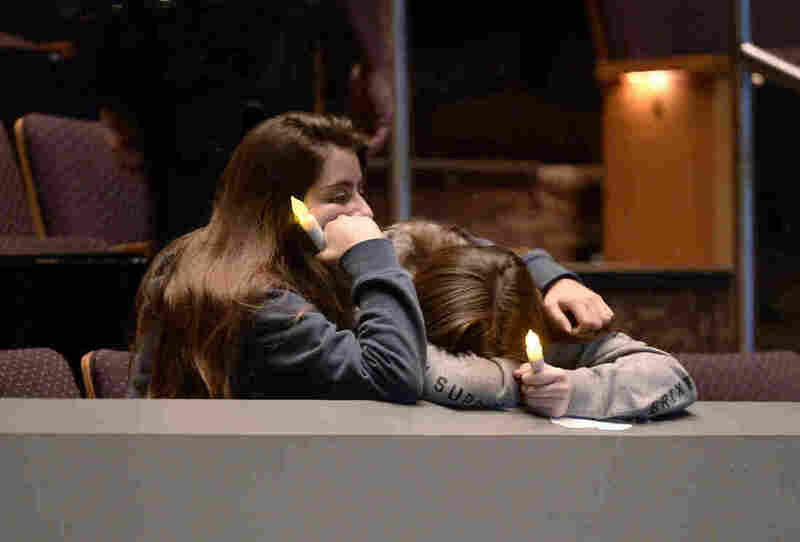 Mourners comfort each other Thursday during a vigil at the Thousand Oaks Civic Arts Plaza for the victims of the mass shooting at Borderline Bar and Grill in Thousand Oaks, Calif.
Ginger Ellenbecker, a high school biology teacher in Lawrence, Kan., has similar feelings. "My immediate reaction was, 'Another one. Here's another one. This is terrible!' But I'm not incredibly surprised," she says. Both Ellenbecker and Chui say they feel bad about their immediate reactions, but science suggests that their feelings are quite normal. It's a natural response called compassion fatigue, says Charles Figley, a psychologist and director of the Tulane University Traumatology Institute. He says thinking too much about traumatic events, whether it's a refugee crisis on the other side of the world or a school shooting in our own country, can make people too anxious or depressed to function in their daily lives. "We of course think about ourselves being in such a place, in which someone would suddenly burst in and shoot things up," says Figley. "But if we think about that too much, then it deteriorates our sense of confidence and our sense of trust and our sense of safety." Numerous studies have shown that human service providers — doctors, nurses, case workers, counselors — can experience compassion fatigue because of having to constantly address, deal with and think through tragedy. Figley says people in these professions have what's called secondary trauma, which can build up and lead to compassion fatigue. "Human service providers are wanting to help — that's one of the reasons why we go into the field — but we recognize we can only do so much," says Figley. "But if they're not able to process that then they gradually begin to shut down in order to protect themselves." Another reason why people might find themselves feeling desensitized in the face of the latest tragedy is something called psychic numbing, which happens when the emotional response to a tragedy doesn't increase when the number of victims does. "The statistics of large-scale killing don't convey emotion," says to University of Oregon psychologist Paul Slovic, a leading researcher of psychic numbing. He and his colleagues demonstrated the phenomena in a recent study that found people are much more willing to donate aid to an identified individual than to an unidentified group of people. Slovic says this is because the emotional circuitry in our brains is bad with numbers. "It can't add and it can't multiply, it reacts very strongly to one person or a small number of people that we can connect with and empathize with and we become emotionally connected," he says. But when more people are added attention and emotion get diffused, response starts to diminish, says Slovic. For Audrey Cho, a teenager living in Grosse Pointe Woods, Mich., reports of school shootings really worry her. She says it's hard not to think it could happen to her, but Cho consciously tries to not let it take over her life. "This is very serious," she says. "But you can't allow it to be so detrimental that you can't leave the house or something, because that's impossible."